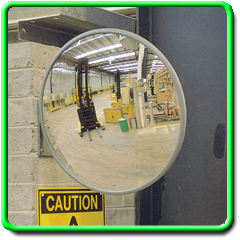 Rated as a Heavyweight Convex Mirror, these mirrors are designed for rugged industrial and traffic situations. The acrylic face is manufactured used the highest grade mirror quality acrylic available, providing distortion free long life mirror. The back is manufactured from a high strength foam core vinyl that has exceptional long life with no deformation. Included with the mirror is our unique J-Bracket which has an easy adjust adaptor to locate the mirror for prime viewing. 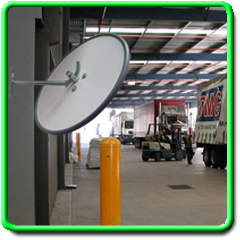 Constructed from oversize steel fitting and zinc coated for long life.